Green Level was originally called Ruby Dew back in the 1930’s. It was a small tobacco farming community that was heavily populated by African Americans. The first school that was built in 1934 for the students of Green Level is still standing today and serves as the Town Hall. Known as Green Level Elementary School, the school hosted students in grades 1-8. Green Level started to grow in the 1960’s when Mr. Ben Mebane sold much of his property to developers who created affordable homes. As time progressed the demographics of Green Level started to change and more citizens started to settle in Green Level. In 1990, the residents of Green Level decided to incorporate the community to officially make it a municipality. The Town adopted a Mayor-Council form of government and elected is first officials. The Town’s first leaders were Plese Corbett, Bob Farrington, Algene Tarpley, Theodore Howard, and Johnnie McBroom. The residents elect the council members, but the council members elect the Mayor. The first Mayor for the Town was Algene Tarpley. 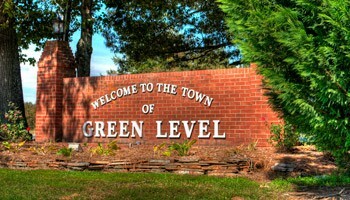 With the swearing-in ceremony, the official birthday for the Town of Green Level is July 17, 1990. The ceremony was held at Green Level United Church of Christ. Over the years, the population of the Town has grown. Based of the latest census, the population of Green Level is 2135 residents. This number is expected to increase within the following years. Green Level is made up of a diverse group of residents ranging in all ages and experiences. 11.3% of the Town’s residents are veterans or retirees. The Town is continuing to grow and prosper. With the Bedford Hills subdivision, which is expected to be completed by 2018, the Town will add 250 single family homes to the community. Additionally, the Town is aggressively looking for businesses and industry that would benefit the residents of Green Level. The Town of Green Level is the home of the first Alamance County Sheriff’s Department police substation.